I’m still not entirely sure how it happened, but just over a couple of months ago, we became the proud owners of some chickens. Mind you; we don’t live in a rural area. We live in the city, but apparently, our large city is rather chicken-friendly. Who knew? I’ll be honest; I have no idea how to raise chickens or take care of chickens, so I leave that up to my google-savvy teenage son who wanted the chickens in the first place. We started out with five hens. I knew enough not to start out with chicks; that’s a lot more work. The original five settled in relatively quickly. The older hens picked on one of the younger chickens in the beginning, but nothing too major. Eleven short days later, we were giddy with joy when one of the hens laid her first egg. We weren’t the only ones. 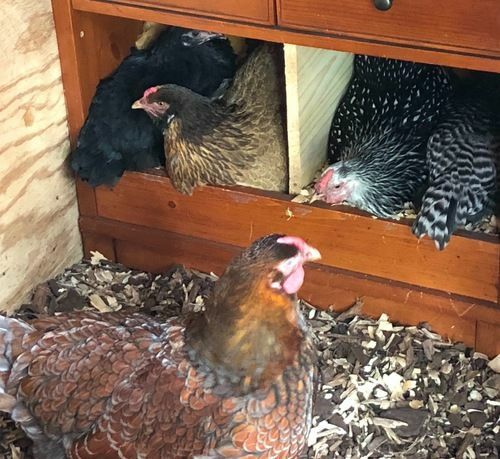 We noticed that over time, the hens would appear to cheer one another on when one went near the nesting box or when one by one, they all started laying eggs. It was as if they had a congratulatory party every single day. I thought it was cute and endearing. Well, we had peace in the coop until we introduced hens number six and seven. Again, I’m not sure how things like this transpire around my home. I mean, isn’t five chickens enough? We were told to separate the two new hens until dusk and then put them in the coop. We were told that it is challenging to integrate chickens into a new environment with other chickens during the daylight hours. It’s best for the chickens to be surprised and wake up with the new hens in the coop. So. Many. Moving. Parts. Well, that was wishful thinking. What we ended up doing was somehow getting two new chickens that were now the oldest and the youngest, respectively, in the coop. The oldest hen has a beak that is super big and very sharp. 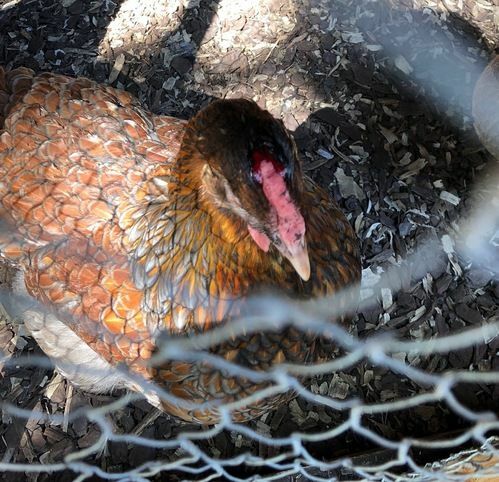 She drew blood on another hen on day two and another one on day three. The third incident occurred while in the nesting box. There was so much blood in the nesting box that it looked like a crime scene. I’ve shed tears over these chickens trying to figure out their positioning in the coop. At times, I’ve yelled their names to avoid an attack (seriously, can a chicken even learn its name?). I’ve pleaded with my son to separate them because I feel so bad, especially for the youngest one who frantically sprints through the coop lest anyone peck and chase her. Through all of this, what I’ve discovered is that the “pecking order” is a real thing. Chickens establish a pecking order within their space, and they will do anything to keep their position. This tender heart has a hard time with it all. It reminds me of children on a school ground trying to assert dominance or insecure people in a work environment. Even though it shouldn’t, it also makes me think of people within the Church. When we run around pecking at people trying to assert our dominance or rightful place in the kingdom, we run the risk of hurting people—sending some into the corner to hide and hurting some so bad, they must leave and find safe shelter somewhere else. Just as I worry whether my baby hen, Olive, is getting any food or water, I wonder if those who can’t find their place in the Church risk dying of hunger and thirst because they aren’t invited in or don’t feel welcome in the place they should belong more than anywhere else. I wish Christians were more like pack animals and not so much like pecking order animals. Packs need and rely on each other; pecking orders, not so much. If Christians are to look different and not look like the world, we can’t be the people who tear others down to elevate ourselves. We shouldn’t try and look better than other brothers and sisters, but instead should come along those brothers and sisters and see how we can help them in their battles. Most importantly, Christians can’t peck at those who are seeking. If the Holy Spirit is drawing a person to the Father, we’ve got to let them not only get to the door but allow them inside. Sideways glances and whispers amongst ourselves will never make a person feel welcomed. Asking them to change their outward appearance before they experience an inward change will never work, and even then, we need to be careful. Jesus loved people right where they were in life. The grungy fisherman—they followed him stinky and all. The woman with the issue of blood—Jesus wasn’t concerned at all that she had touched him. The lepers’ sores weren’t an issue for Jesus. The prostitute who washed Jesus’ feet let her hair down—Jesus didn’t even mention it. None of these outward things bothered Jesus; his only concern was their hearts. Jesus said, "You like to appear righteous in public, but God knows your hearts. What this world honors is detestable in the sight of God” (Luke 16:15, NLT). My chickens don’t care if they hurt the other chicken’s hearts because all they are concerned with is being at the top of the pecking order. We, Christians, are not to act like chickens. We are to be like Jesus. Jesus voluntarily chose to leave the right hand of God the Father to come to earth and love the least. We need to love the least like Jesus does, and agree there is no place for a pecking order in the kingdom of God. Jesus quickly shut down a pecking order notion when James and John asked to be seated at the right and left side of Jesus. It’s a good thing for James and John the ten disciples who heard the request had been changed by spending time with Jesus! Jesus’s response to their request was priceless. “You want to be the greatest? Then you must become the servant. Are you willing to do that?” (paraphrase mine; Mark 10:35–45). May we spend more energy and time welcoming people in instead of trying to box them out or making them feel less than worthy to get to Jesus. There is only One who sits at the top of the pecking order in the kingdom of God. The rest of us are merely brothers and sisters who need one another in this life. As the writer of Hebrews said, “Let us think of ways to motivate one another to acts of love and good works. And let us not neglect our meeting together, as some people do, but encourage one another, especially now that the day of his return is drawing near” (Hebrews 10:24–25, NLT). And, not only do we need one another, we’ve been commanded not to stay in our safe, Christian coops but to reach out to those who need to hear about Jesus. It’s a daunting task for a chicken to leave its coop but once they become brave, they realize God gave them the ability to do something their predators can’t do—fly. When in danger, the chicken will fly up onto a roost or into a tree. Christian, God gave you the gift of the Holy Spirit to help you feel brave enough to witness to and love on the spiritual orphan. He will give you eyes to see the person as He sees the person. We shouldn’t be afraid of those who aren’t like us or believe something different than us. Instead, we need to learn to rely on the Holy Spirit to help us get outside of our comfort zones so that we can cheer on many new believers in the faith.